Sure to be a perennial holiday favorite, like The Little Old Lady Who Was Not Afraid of Anything," a book that makes the bestseller list every single Halloween! Former Disney Publishing executive, Lauren L. Wohl, tells an all-new story starring a favorite character from folklore with an autumnal chill and a special treat that brings the book to a perfect-for-Halloween ending. Children will want to return to the teeny tiny house again and again to enjoy Henry Cole’s illustrations that capture the mood and the humor of the tale. Anything tiny is bound to be adorable (tiny animals, tiny babies, etc. ), so it goes without saying that a teeny, tiny woman on a teeny, tiny Halloween is guaranteed to delight. Children will love the imagery of the tiny house and the tiny woman as she lives in a great big forest. Unfortunately for the tiny woman, her tiny house is buried within mountains of Autumn leaves illustrated in beautiful oranges and reds. Every year when her house is buried, the tiny woman screams out for help, but to no avail. Eventually, she has the idea to bake cookies, hoping the delicious smell of warm cookie dough will bring someone who can help her. And she's right. Since it's Halloween, three friends are roaming the woods and smell the delicious cookies. They find the tiny house and are able to enjoy the cookies while helping the woman with the leaves. While I think most children are taught not to go inside a house when trick-or-treating, parents may need to clarify this to their children when the cat, the witch, and the ghost enter to eat cookies. It wouldn't hurt to reiterate "stranger danger" at this point. However, the overall plot is not hurt by this at all. In fact, it gives parents an opportunity to discuss this with their children. 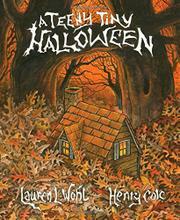 Perfectly appropriate for the season, there's nothing teeny or tiny about how great this book is for kids!